Combining the elegance of old-world architecture with modern touches, our distinctive first-class getaway in Lucerne is as stylish as it is luxurious. Reflecting the chicness of the surrounding town, the Renaissance Lucerne Hotel is the perfect destination for the refined traveler. Behind our stunning historic facade, you’ll find top-notch Mexican cantina cuisine at Pacifico restaurant and an excellent selection of classic drinks and fanciful cocktails in the Boca Grande Bar & Smoker’s Lounge. Uncover the hidden gems of Lucerne itself with the help of our resident Navigator or simply relax in the understated comfort of our spacious lounge. 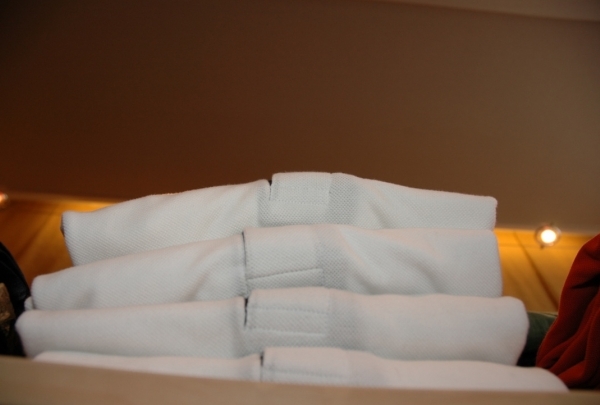 Either way, you can rest easy in the knowledge that your stay with us will be a relaxing one. On offer are cuisine classics like antipasti, homemade pasta, risotto and wood-fired pizzas. The best Pizza in the city! 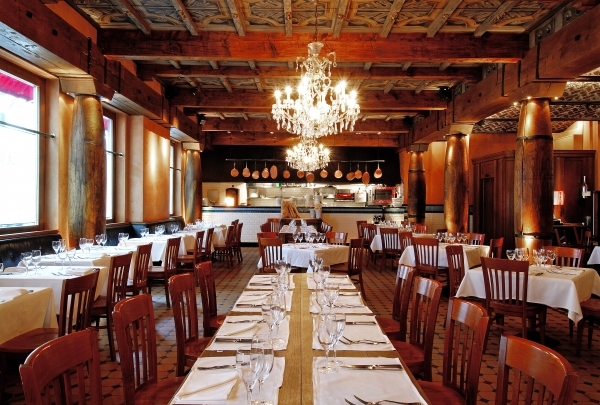 La Cucina is a great addition to Hotel Astoria’s dining scene. Italian inspiration dominates the menu, decor and ambiance of this critically-acclaimed restaurant. Complement your meal with exquisite wine and spirits. Dazzling chandeliers and an engraved ceiling make for an interesting contrast to rustic wooden furnishing. Not only do they provide a great selection of classical drinks, you can find here as well fantastic cocktails creations. Simply said: a must try! 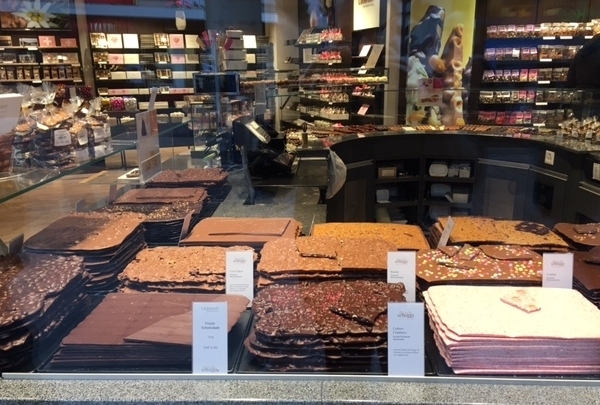 Don't miss the chance to taste top-quality, hand-made Swiss chocolate specialties. 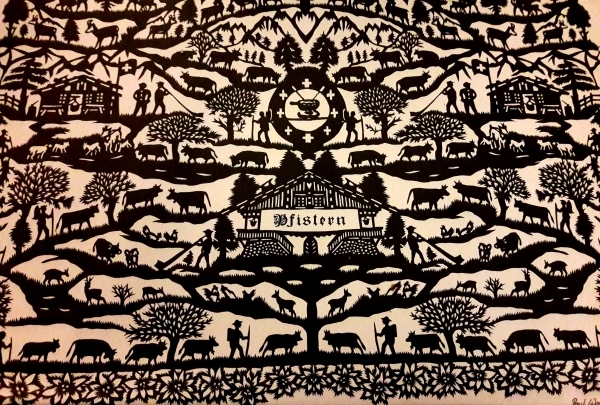 The family-run company produces probably the best chocolate found in Switzerland. 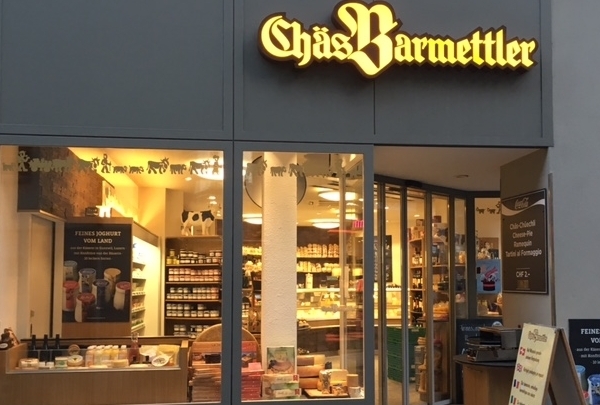 Check out their store in the old town of Lucerne and try new variations such as the Raspberry-Blackberry, White Chocolate and more. Take a stroll along a part of the city wall of Lucerne. Stroll for ten minutes past the hotel and you will find the Musegg Wall, which was built to protect the city. Nowadays you can walk along the wall and even 4 of the 9 towers are open for visitors during the summer months. A half day trip up Mount Pilatus makes you forget all your sorrows. In the Middle Age it was told that the mountain was the home of a salutary dragon and several ghosts and spirits. Nowadays it is the home of the steepest cogwheel train in the world, challenging climbing tracks and enchanting hiking trails. It is truly an adventure for the whole family. The Thai Garden restaurant offers a delicious choice of traditional Thai dishes housed in an impressive and authentic Northern Thai setting. Thai entertainment by enchanting sounds from the Thai dulcimer ensures an unforgettable dining experience that takes you to the Far East. This is the best shop to try delicious cheeses. This family-owned cheese establishment was founded in 1972 and is now in the hands of the second generation of the Barmettler family. Sample their impressive variety of cheeses and pick one or two out to bring home with you. They will even pack your selection in an odor-blocking container. Enchanting, Splendid, Bewitching. 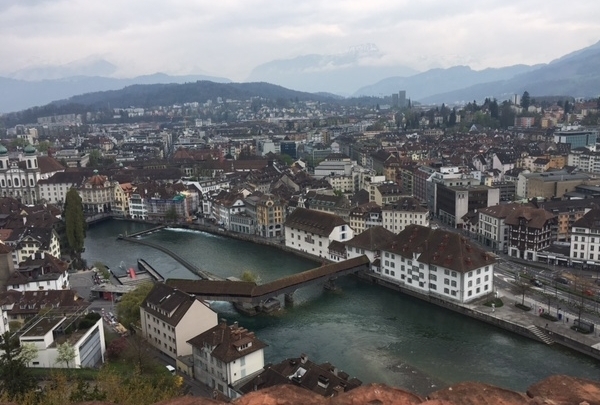 No other words can describe the view of the Alps and Lucerne from the top of Hotel Astoria. 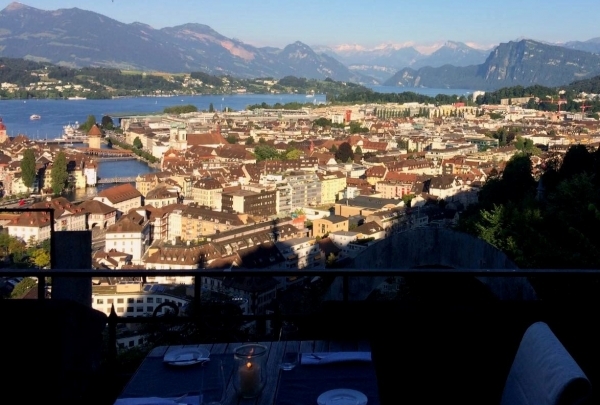 Drinking takes a back seat at the 360° Roof Top Bar as you take in an unparalleled view of the mountains and Lucerne. 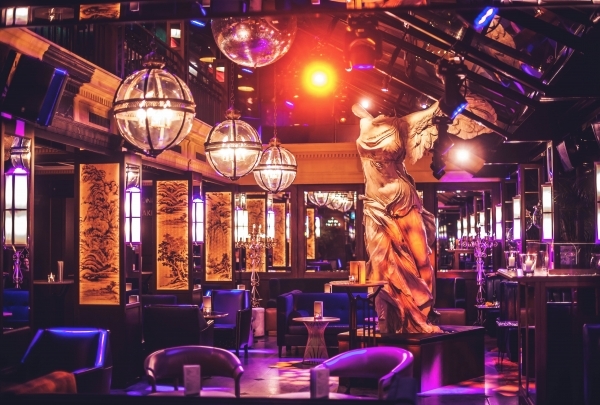 An extension of the elegant Hotel Astoria, the decor of the lounge bar is stylish and attracts an elite crowd. As far as the drinks are concerned, the cocktails accentuate the experience of drinking at the Penthouse Roof Top Bar. The address for watches since 1854. 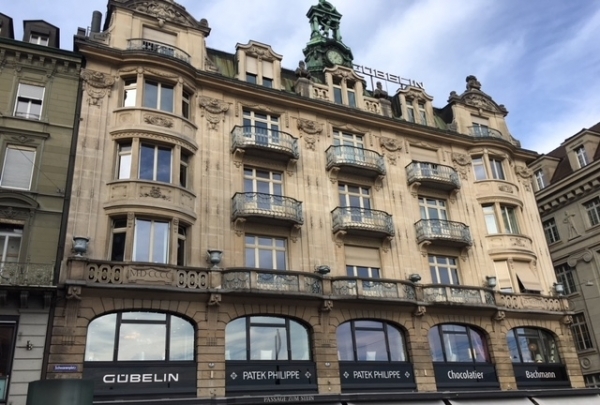 The oldest boutique of the Gübelin brand is located in the former "Hotel d'Angleterre" in Lucerne. Visitors can discover exclusive jewelry and watches of famous partners from the watchmaker's branch. 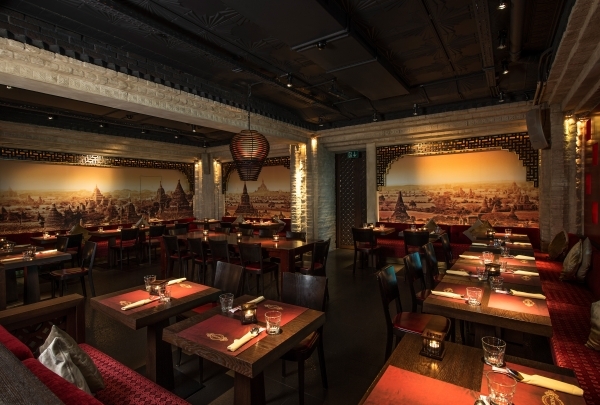 Mekong offers authentic dishes in a beautiful decorated setting. 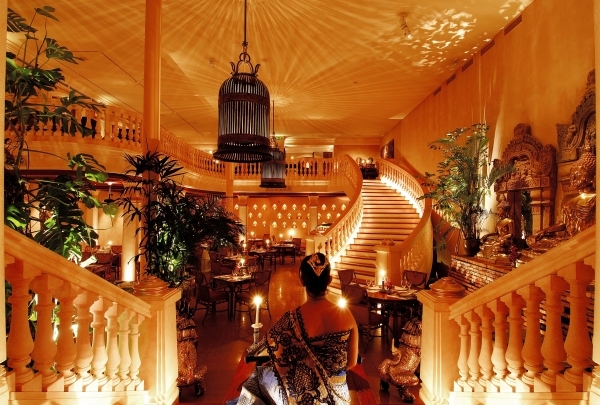 The establishment boasts an Asian-inspired design that is a delight to enjoy a meal in. Even before the invention of the cinema people loved visual illusions. 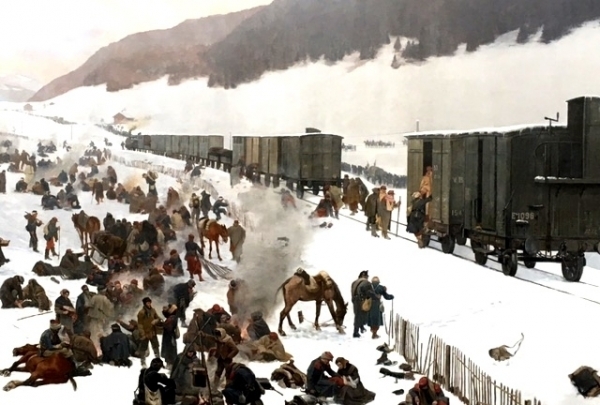 The Bourbaki panorama depicts a moment when the Swiss Red Cross provided asylum to 87,000 French soldiers during the year 1871. You will also find the house of media, encounter and culture at the site of this panorama. 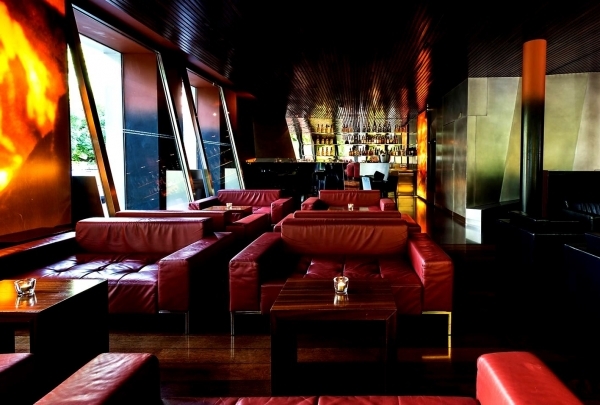 ‘The Lounge’ at ‘The Hotel’ was designed by innovative French architect and Pritzker prize winner Jean Nouvel. 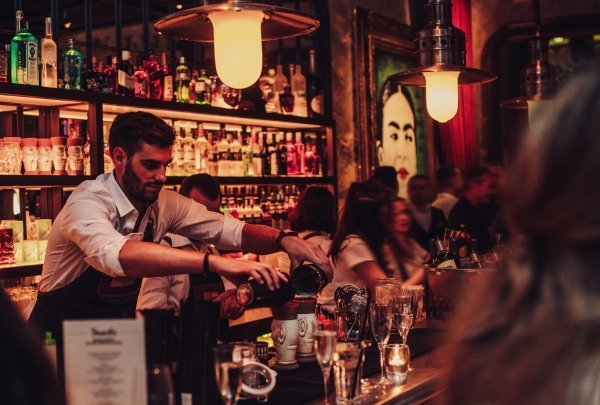 Whilst enjoying the excellent cocktails and fancy drinks you can unwind by listening to relaxed lounge music. On the weekend The Lounge invites tourists as well as locals to dance to the beats of a live DJ. Understand Picasso on a more personal level at an intimate gallery built by his lifelong friend. 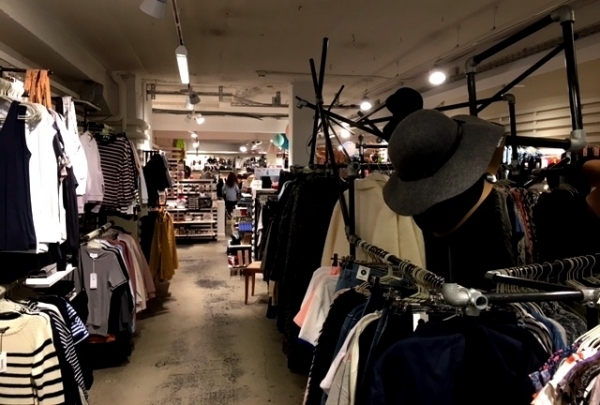 This shop is a storehouse for popular brands and one-stop shop for men's fashion. Ralph Lauren, Hugo Boss, Armani; name it you'll find it. Shop from the biggest brands in fashion at Kofler Men. A part of a renowned chain of stores geared toward women, the shop is a shopping paradise for men, offering apparels and accessories from brands like Hugo Boss, Signum and Ralph Lauren. From stylish leather jackets to classy boots, get ready to stumble up on latest products. The chapel bridge and its famous water tower date back to the year 1332. The beautiful bridge is a must-see while in Lucerne. This bridge is the connection between the magical old town and the modern new town. The two sides of the city are separated by the river Reuss. In 1993 the bridge was rebuilt true to the original after a fire destroyed most of it. 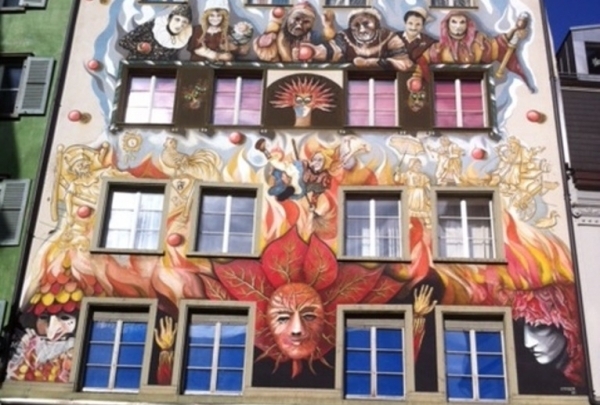 During your walk through the historical old town of Lucerne you will pass the famous Fritschi-Haus with its colorful paintings on the wall. It is also known as the "Fasnachts-Haus der Schweiz", which means the "Carnival-House of Switzerland". 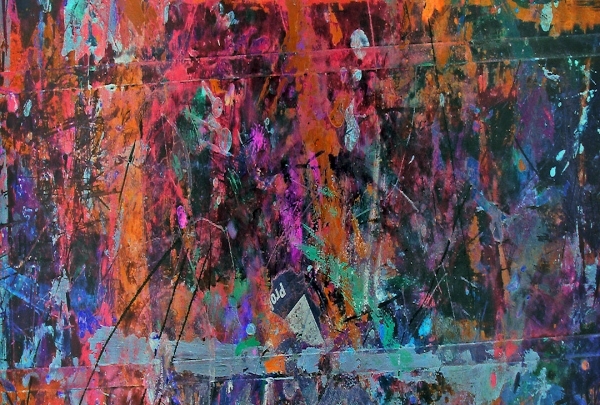 The paintings display the Fritschi history, as well as the Lucerne Carnival. Gaze upon one of the world's most emotive war memorials: the dying Lion of Lucerne. The dying lion is one of the most famous monuments in the world. 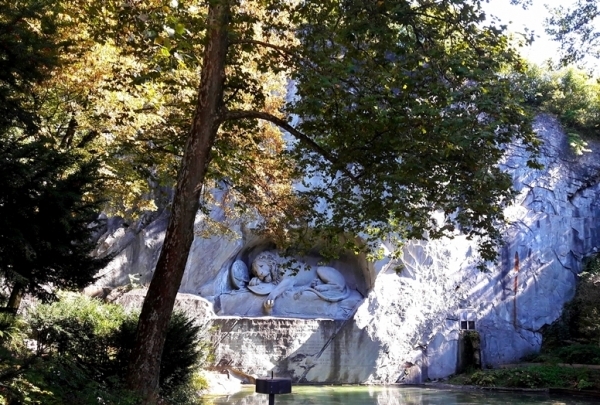 The designer, Bertel Thorvaldsen, carved it into the natural rock in memory of the Swiss Guards who were killed in 1792 during the French Revolution. Mark Twain described the Lion as the saddest and most moving piece of rock in the world. On the fountain you can see the masks of Fritschi, his wife and the faces of his nursemaid and servant. 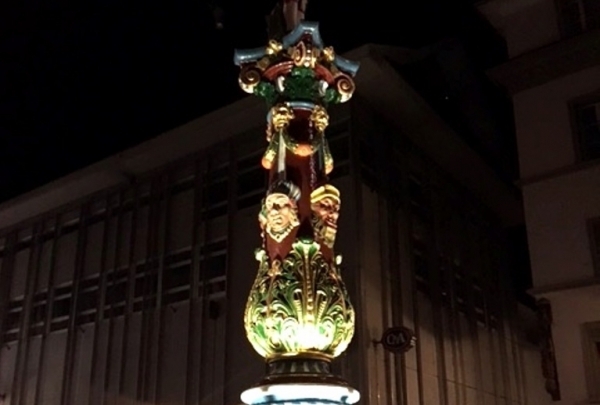 Four fools' masks spew water from goats' horns into the hexagonal trough. The column of the fountain bears the statue of a standard-bearer. 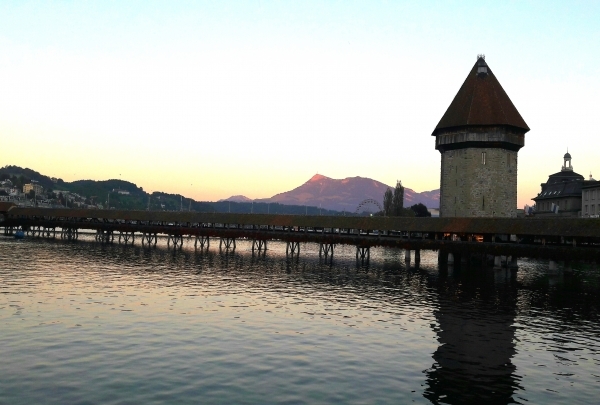 Are you searching for the most stunning view in Lucerne? Well, here it is. The Hotel, Bar and Restaurant Château Gütsch has offered delicious food, drinks and view for 120 years. It is one of the spots favored by tourists and locals alike. Pfistern is one of the favorite traditional restaurants in town. From Fondue or Raclette to Cordon Bleu, traditional sausages with gravy or Rösti with egg and bacon, Pfistern makes your Swiss food wishes come true. During the winter months they offer 100 different kinds of fondue in there romantic winter garden. Browse through urban & vintage fashion. Fizzen combines vintage finds with items created by newer brands. This find is a must-visit for all our hipster and retro clothing enthusiasts and anyone who is interested in fashion. Explore the magic of art, music and architecture. The KKL is the culture and congress centre of Lucerne. The extravagant design by Jean Novel and the location next to the lake makes this building one of the main attractions in Lucerne. But thats not all!! There is always something fun happening in this cool space. Catch a concert in this beautiful complex. Browse through a gorgeous selection of watches. 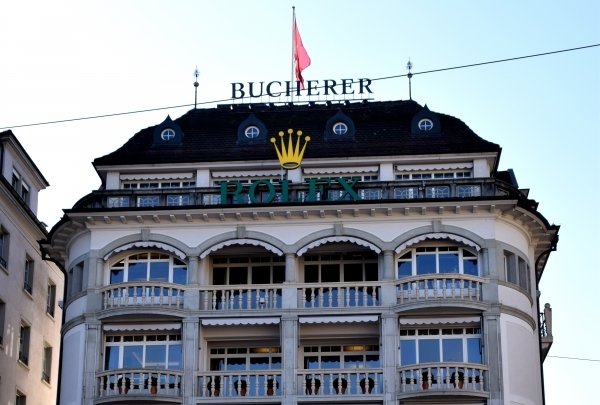 Check out the biggest selection of Swiss and international watches in Lucerne. Explore a part of the Vierwaldstättersee! 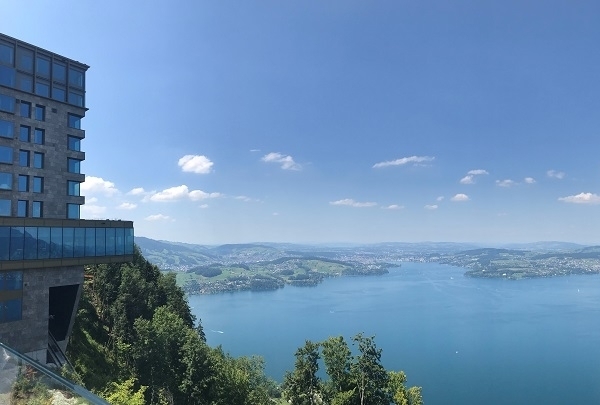 The Vierwaldstättersee, also known as Lake Lucerne, offers plenty of different boat rides, that last from one to six hours. 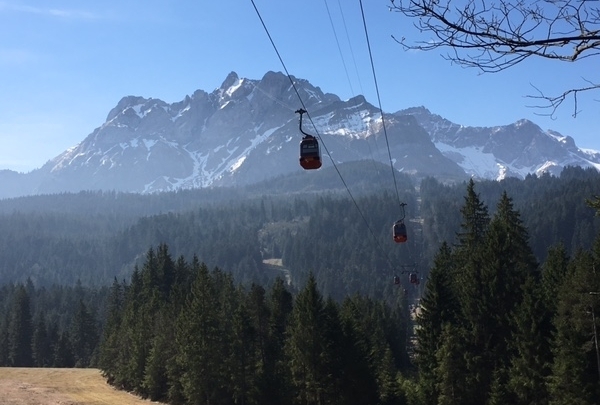 One of the most beautiful tours is the ride to Meggen. Meggen is a beautiful town close to the city dotted by tiny hidden beaches and nice walking and hiking trails. Enjoy this adventure for the whole family. 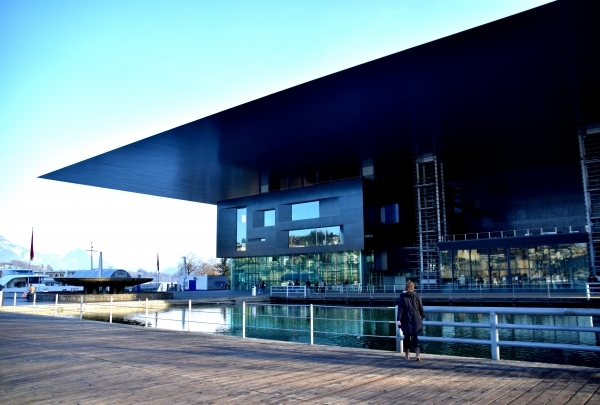 This museum features the biggest cinema in Switzerland as well as a variety of exhibits that are sure to delight. The best part is exhibit about transportation. There you will find every kind of public transportation possible. Definitely a must-see for all families and transportation lovers. Visit this beautiful Jesuit church. 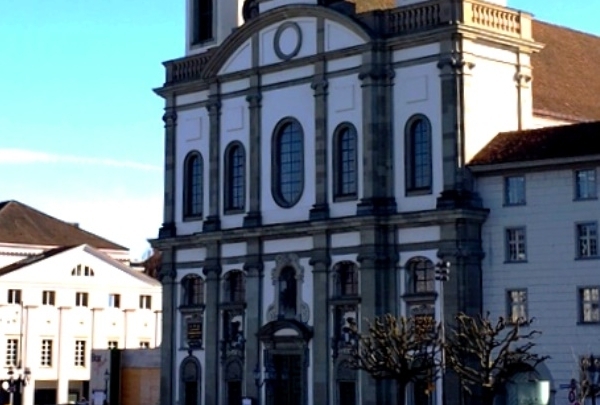 This church used to be a school church for the combined Jesuit School until 1773. Nowadays it is a Catholic church where a theological faculty meets. The patron of the Jesuit Chruch is Franz Xaver, who lived from1506 until 1552. 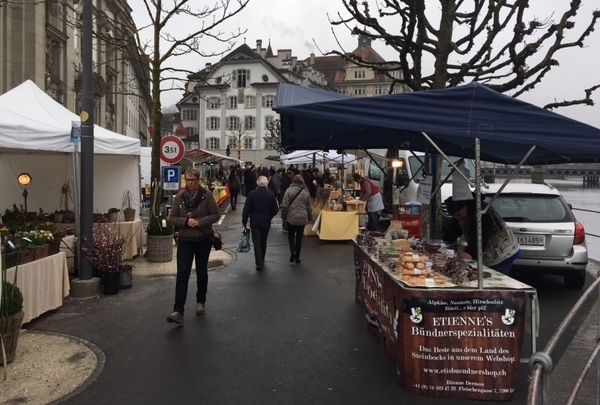 Enjoy a stroll through the nicest weekly market in Switzerland which takes place every Tuesday and Saturday morning. Check out one of the prettiest markets in Switzerland which takes place every Tuesday and Saturday from 6 am to 1 pm on both sides of the River Reuss in the Bahnhofstrasse (left riverside) and the Unter der Egg (right riverside). It is located only 5 minutes from the hotel and you can explore stalls selling fresh fruits and vegetables, fish, Swiss cheeses, meat, and colorful flowers. 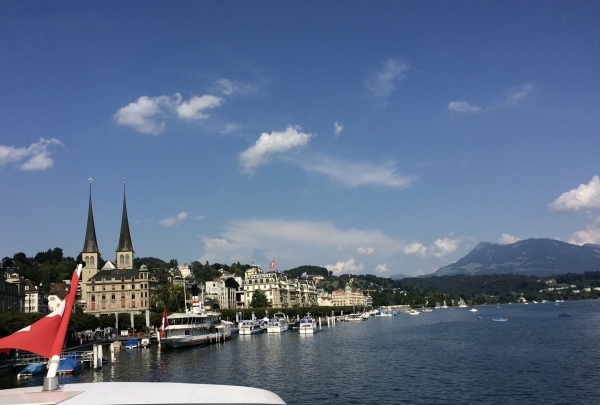 Enjoy a 1-hour audio guided tour of the picturesque Lake Lucerne on the modern yacht Saphir! Refresh your senses and take in the first class comfort of the cutting-edge ship MS Saphir. The stylish design and dashing appearance of the elegant yacht will definitely impress! Check out features such as the convertible roof on the upper deck and the aqua terrace on the main deck. 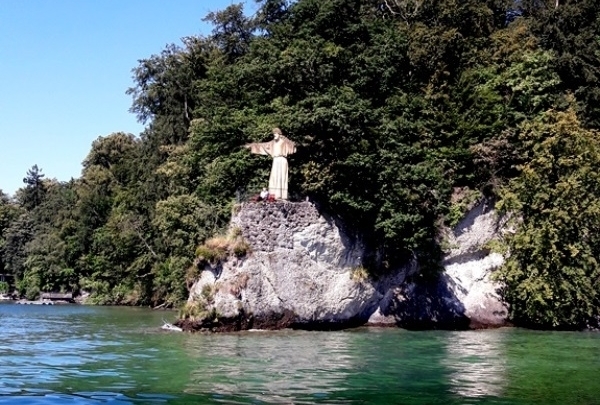 Also take advantage of the audio guide available in 11 languages that narrates the top attractions on Lake Lucerne. Visit a lush park complete with a playground. 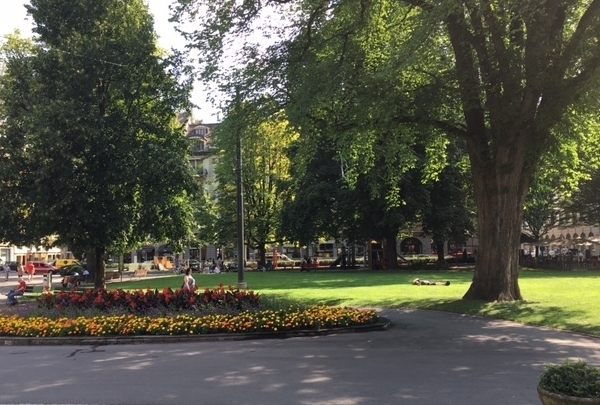 Just a minute's walk from the hotel, this park is enjoyed by local residents looking to escape the bustle of daily life. Join them and get a breath of fresh air at Vögeligärtli. 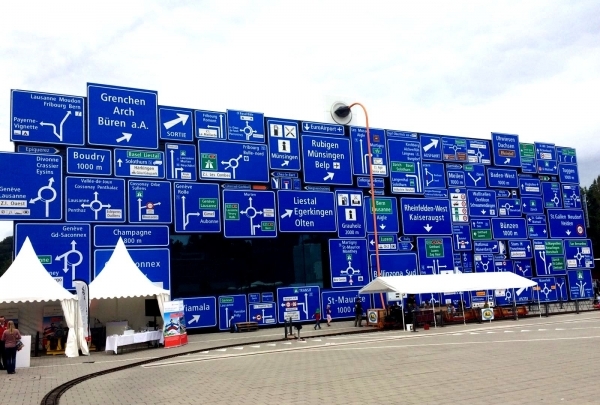 Come visit the biggest bookstore in central Switzerland. 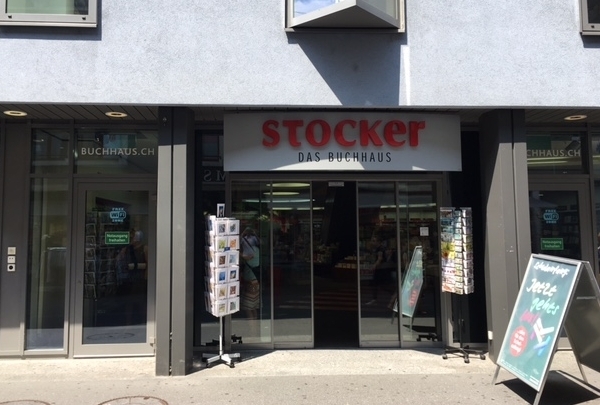 Find everything from magazines and maps to books in both German and English at Stocker Buchhaus. You'll also find a coffee shop inside, where you can enjoy a warm cup of coffee while browsing. The Rigi, which is also known as Queen of the Mountains is part of Alps and can be reached with a one hour boat ride from Lucerne. The Rigi Railways serving parts of the mountain is Europe's oldest mountain railway. The mountain has many nice hiking trails and offers spectacular views of the surroundings. The lake “Rotsee” is a natural reserve, at about 2.5km long and up to 300m wide. 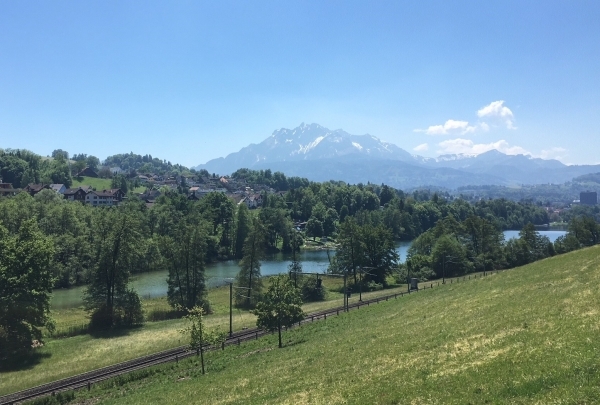 It offers a miraculous greenbelt recreation area in Lucerne, for the locals and tourists alike. Moreover, it is also the venue of the annual International Rowing Competition. From April to October you can enjoy this 40 minute nonstop tour with audio guide and see the most famous sights of the city. 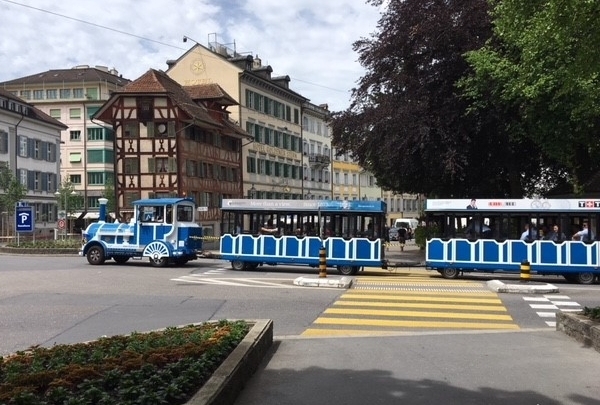 The journey starts in front of the Hotel Schweizerhof. Just sit back and enjoy the ride. A very unique store not only for the kids but also for everyone who's fascinated by natural phenomenons like Gravity. 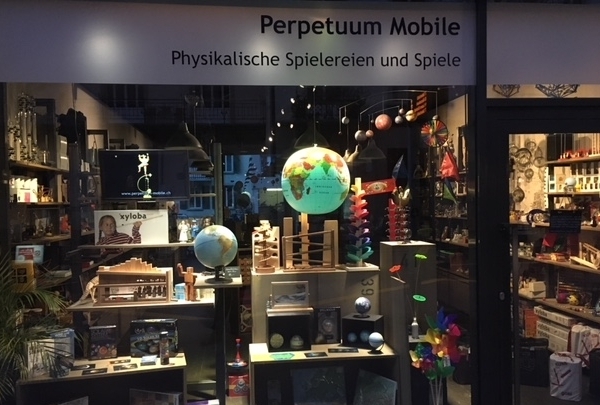 This shop is since 10 years the address in Lucerne to find amazing and intriguing gift ideas for young and old. There are always new surprising and inspiring gadgets to be found. The village of Mürren is a small typical Swiss village, located at the foot of the Schilthorn peak. Mürren is 1650 meters above sea level. The directly view to the Jungfraujoch as on the other alps sourrandings, creates a heavenly atmosphere, which is percfect for a relaxing and memorable day. 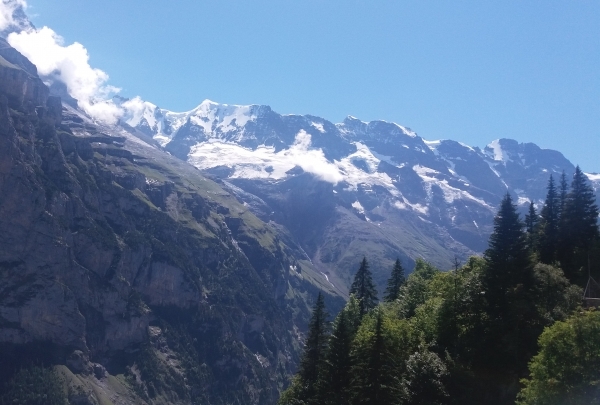 From Mürren there is also the cable car reaching the stunning peak of Schilthorn. 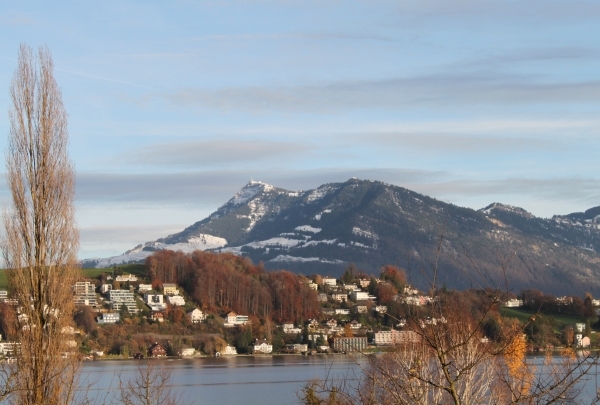 The Bürgenstock is a mountain located along Lake Lucerne. A newly constructed 5 Star resort is the pinnacle of the mountain. This resort offers an outstanding spa and fine dining culinary experiences to the patrons. Bürgenstock is a hiker's paradise. The Hammetschwand Elevator here is also worth a ride. Largest Mall in central Switzeland with over 150 stores, a food court, indoor surfing and a cinema complex. With 150 stores spread on three floors, the Mall of Switzerland is one of the largest Malls in Switzerland. 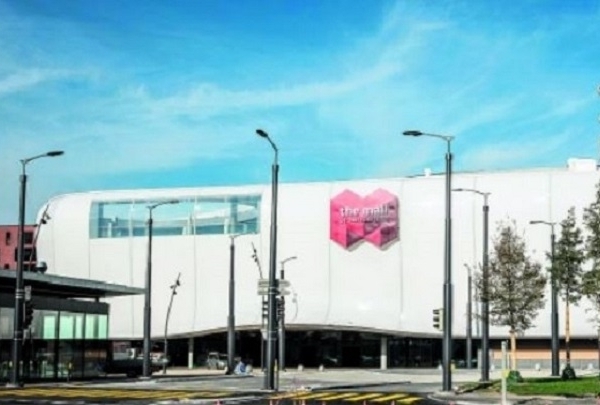 It even has indoor surfing and a cinema complex comprised of 12 screens. Even if you don't buy anything, it's still worth the visit, especially on a rainy day. A great place to take a little something home from Switzerland for friends and family. 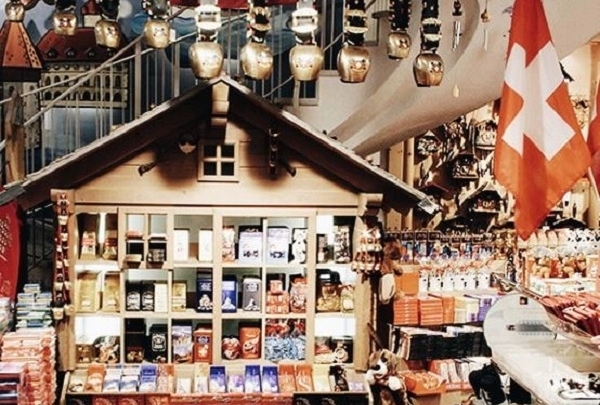 A souvenir shop that offers a wide range of traditional Swiss handicrafts, such as original cuckoo clocks, swiss knives, watches and of course, the famous Swiss chocolate. The plethora of options at Casagrande will impress you. Enjoy ever-popular fajitas, juicy steaks, home-smoked spare ribs and Cajun wings in a stunning ambience. The Pacifico's celebrated cocktails and margaritas are highly recommended before and after a meal. In summer our outdoor terrace is open too. Bienvenidos!.